Sea Front Bungalow with 2 Bedrooms and 2 Bathrooms. Free Wifi. Property 3: Sea Front Bungalow with 2 Bedrooms and 2 Bathrooms. Free Wifi. Apartment with great Sea Views and Community Swimming Pool and private parking. Property 4: Apartment with great Sea Views and Community Swimming Pool and private parking. 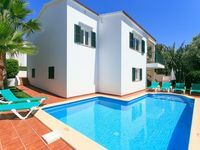 Property 33: Lovely Spanish Villa with Heated Pool,Hot Tub,SKY TV,Air Con,Xbox,FREE WI-FI! 3 Bed Villa With Private Pool,Hot Tub,Pool Slide,Air-Con, UK SkyTV & FREE WI-FI! Property 35: 3 Bed Villa With Private Pool,Hot Tub,Pool Slide,Air-Con, UK SkyTV & FREE WI-FI! Villa Ca'n Guel with Private Pool. Property 48: Villa Ca'n Guel with Private Pool.